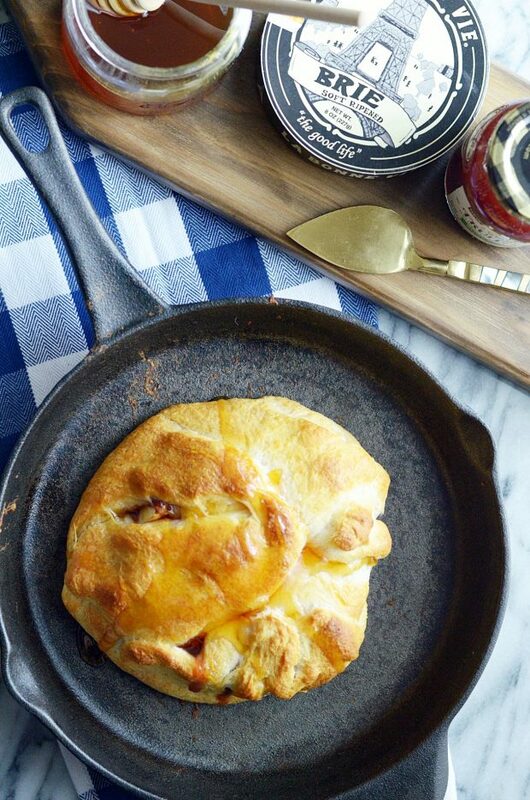 Buttery, flaky crescent roll dough stuffed with gooey brie cheese, strawberry jalapeño jam, with a drizzle of honey. A crowd winning baked brie! 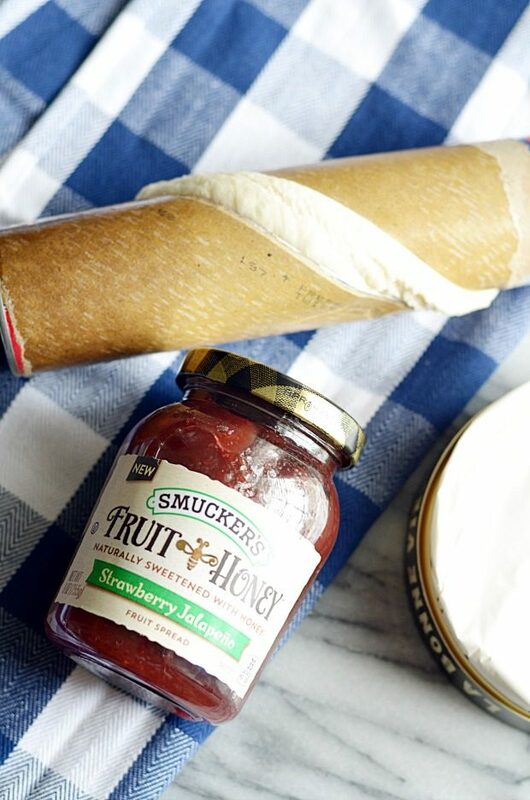 I recently teamed up with Smucker’s to try out their new selection of Fruit & Honey fruit spread. Have you tried them yet?? As I’ve gained more and more experience in working with brands, I’ve become pretty choosy about the products I want to give my 10000% stamp of heck-yes-I-love-this! 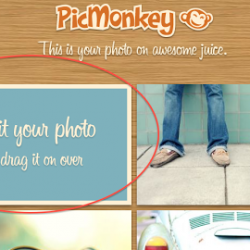 And let me tell you… this was a no brainer. The moment I tasted that Strawberry Jalapeno jam, I knew exactly what I wanted to make. With the holidays coming up, it had to be something worth serving to guests at a big party and comfortable enough for a cozy little gathering with friends. It had to be something warm and inviting. 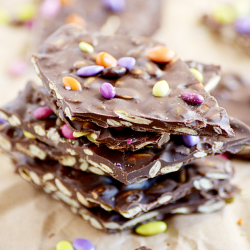 And it definitely needed to involve cheese– something to balance out both the sweet and spice of the fruit spread. It obviously had to be baked brie. 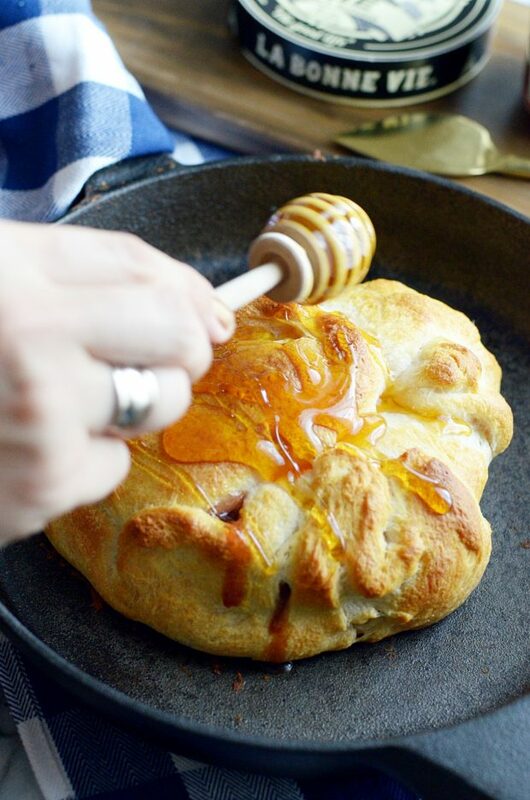 Baked brie is one of my go-to recipes for entertaining guests. It seems like a fancy special occasion food. But honestly, it’s one of the easiest recipes to throw together. With less than 5 minutes of prep and then only about 15 minutes in the oven, it’s a minimal time investment with maximum taste yield! 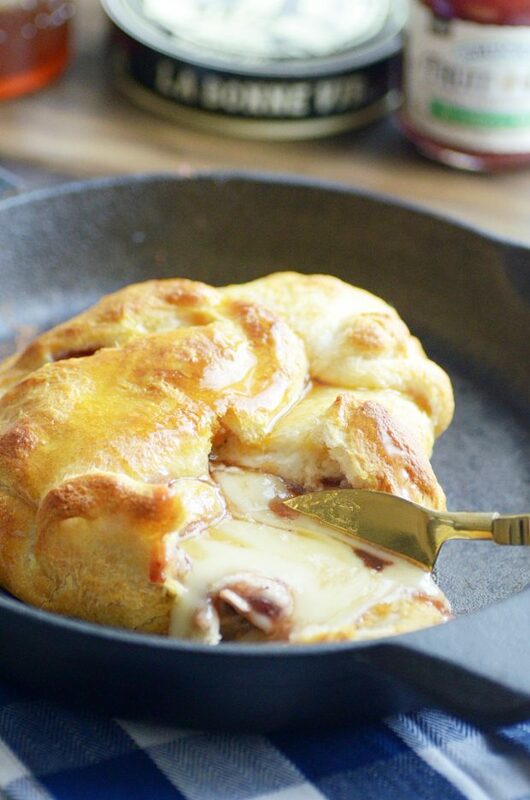 Making this baked brie is about as easy as it comes. Simply unroll refrigerated crescent roll dough and make sure all the perforated edges are pinched and sealed shut. 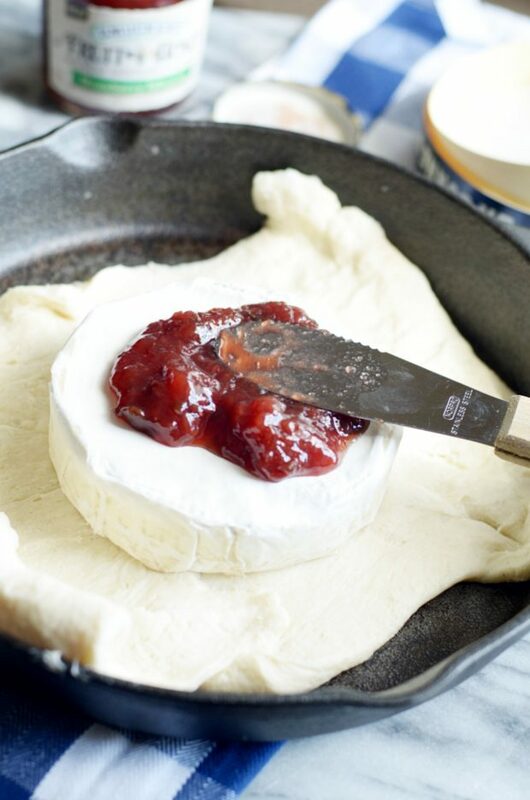 Place a round of brie in the center, and then spread the jam on top. Wrap it up tightly, and bake for 15 minutes. Voila! 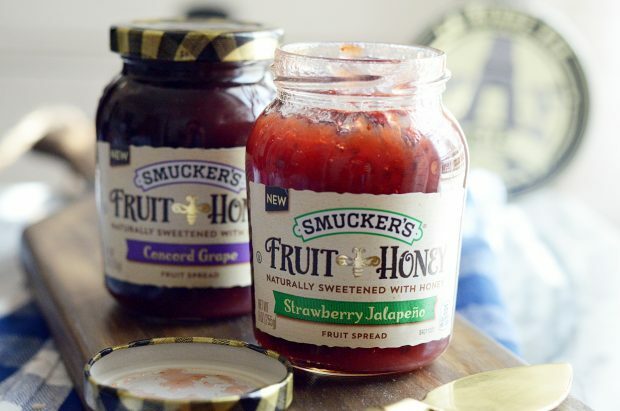 Even though Smucker’s Fruit & Honey fruit spread is already sweetened naturally with honey, I can’t resist drizzling a little more honey on top. But that’s your prerogative. I’m honestly not sure what I like best. 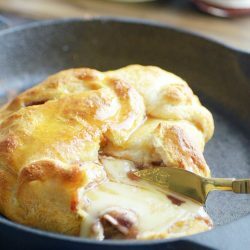 The gooey melted cheese? The flaky buttery crust? The strawberry jalapeno fruit spread that perfectly balances sweet and heat? That irresistible drizzle of honey on top? How easy it is to throw together?? I can’t choose. And thankfully there’s no need! Enjoy ☺️. And another big thanks to my friends at Smucker’s for sponsoring this post. 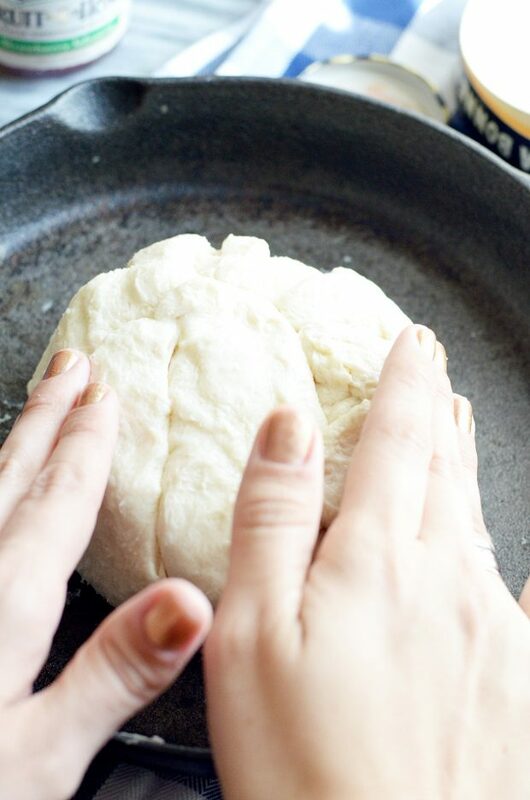 Unroll the dough and pinch perforated edges closed. Place the wheel of cheese on top. Spread the jam over the cheese. Wrap the cheese in the dough, be sure to pinch close the seams. Serve warm with fruit and crackers.